Clowns bring out the kid in everyone. 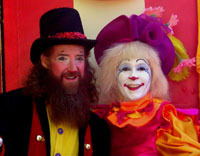 Whether you are entertaining young children at a birthday party or need that special something different for a family or corporate event, these party clowns are sure to bring a smile to your face. They are talented and fun, adding extras like balloon art, pocket magic, face painting, and some story telling to delight your audience.